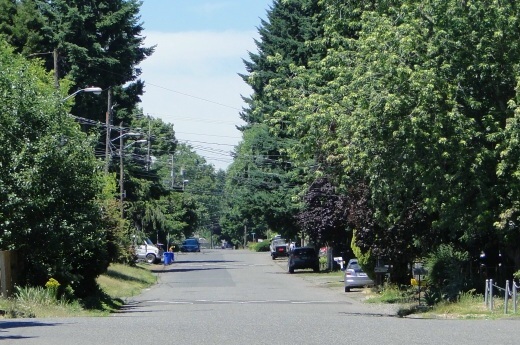 As we were finishing up our walk (see my previous post), I asked Portland planner Radcliffe Dacanay if there just might be some neighborhoods not so walkable that I could visit? "Just head straight east on Division Street about ninety blocks," he replied. 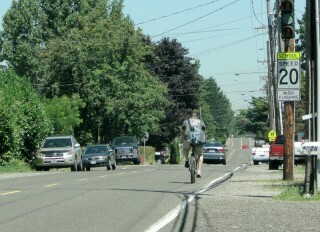 These are the newer parts of Portland, not the street-car era, close-to-downtown, neighborhoods. 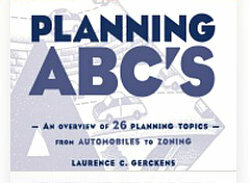 The pattern of development there reflects the post-World War II preference for low-density, auto-centric living. You'll find schools, parks, and plenty of shopping -- but, basically, it's just a lot more spread out. 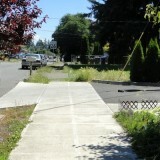 Many of the sidewalks in this part of Portland just seem to end mid-block. Sidewalks are scarcer in this part of the city -- but how much of a problem is that given the distances many residents would have to walk to get to shopping, and what seemed like fairly low traffic volumes on the relatively wide residential streets? 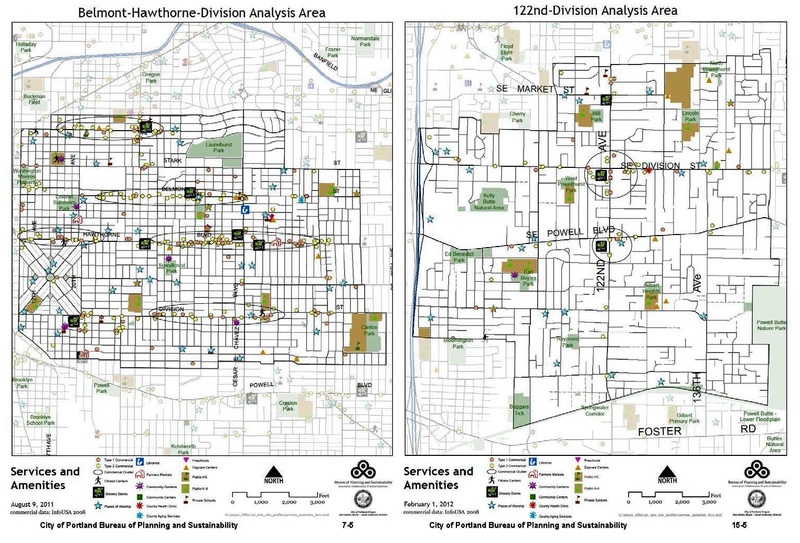 Here are some comparison maps and text from the Portland 20-minute report. 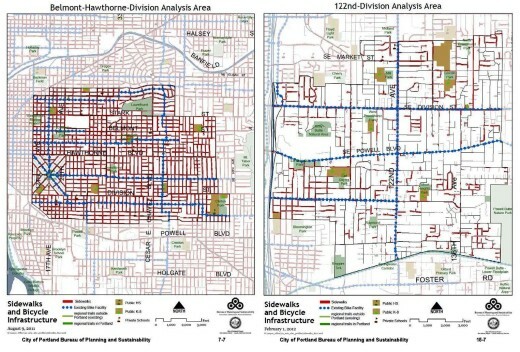 First, you'll see a map of the Belmont-Hawthorne area (where I walked with Dacanay and his colleagues), then the corresponding map of the 122nd and Division area, which I spent some time driving through. 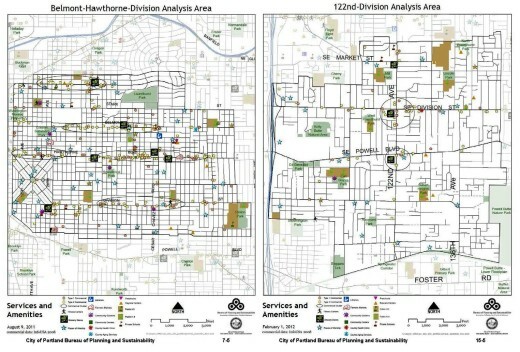 You can download Portland's "20-minute neighborhoods report" (warning: it's a fairly large 24 MB pdf file) and then read through the sections dealing with the Hawthorne-Belmont, and the 122nd and Division, areas (each of these sections includes about 15 minutes pages of maps, charts, and analysis). I encourage you to click on the maps below; they'll open in a pop-up window at larger, more readable, size. Much of this area is composed of a compact grid of residential blocks, originally developed during the Streetcar Era with a continuous system of sidewalks. The area includes an extensive series of main street business districts, lined by storefront commercial buildings. Access issues. Good street and sidewalk connectivity. Good access to commercial and community services, and the area has among the best access to frequent service transit (bus) in the region. The area includes a diverse a mix of block types, which are often large with deep lots, and most streets lack continuous sidewalks. The area’s larger commercial areas, located at the intersections of major arterial streets, are primarily auto-oriented shopping centers fronted by surface parking lots. Access issues. The area lacks good street connectivity and most secondary streets lack sidewalks, as do some major streets (Powell, portions of 122nd Avenue and Division). 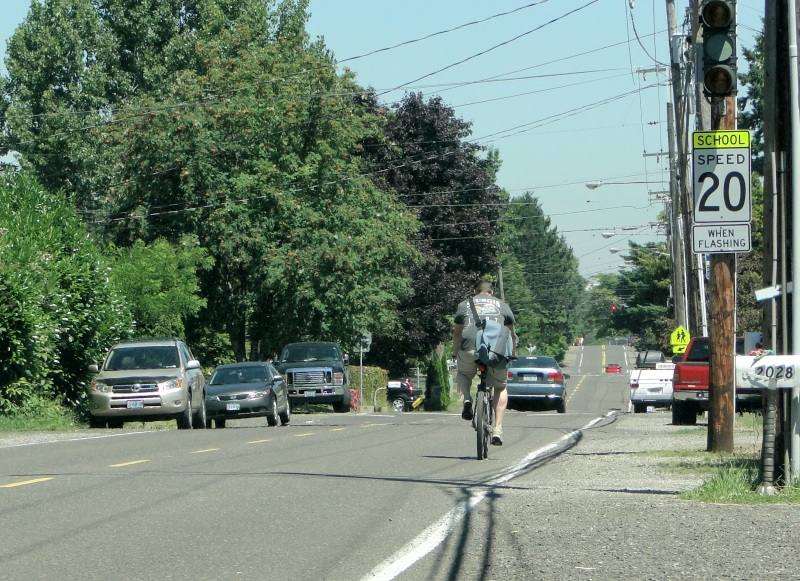 These conditions, combined with infrequent signalized crosswalks on the area’s major streets, limit pedestrian access to the area’s commercial services. Limited access to frequent service transit. 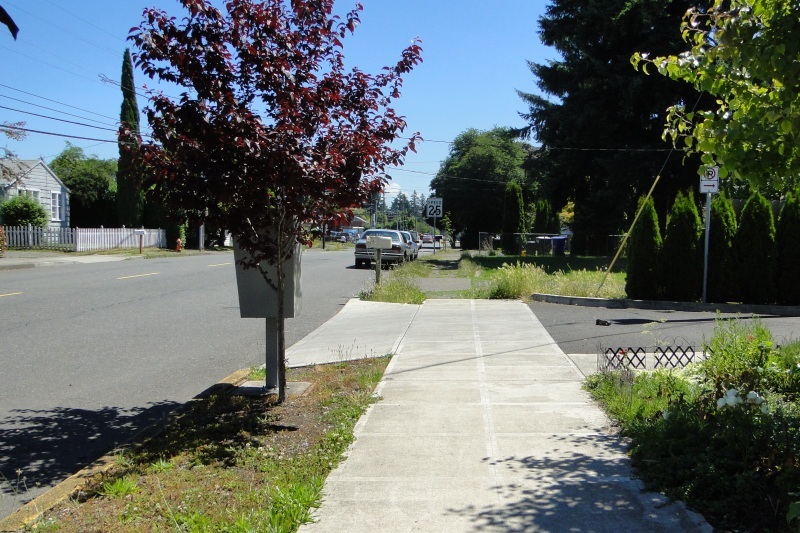 Some of the area’s parks are unimproved and there are few pedestrian connections to the Springwater Corridor, limiting pedestrian access to recreational opportunities. The I-205 Freeway serves as a barrier to adjacent areas to the west. 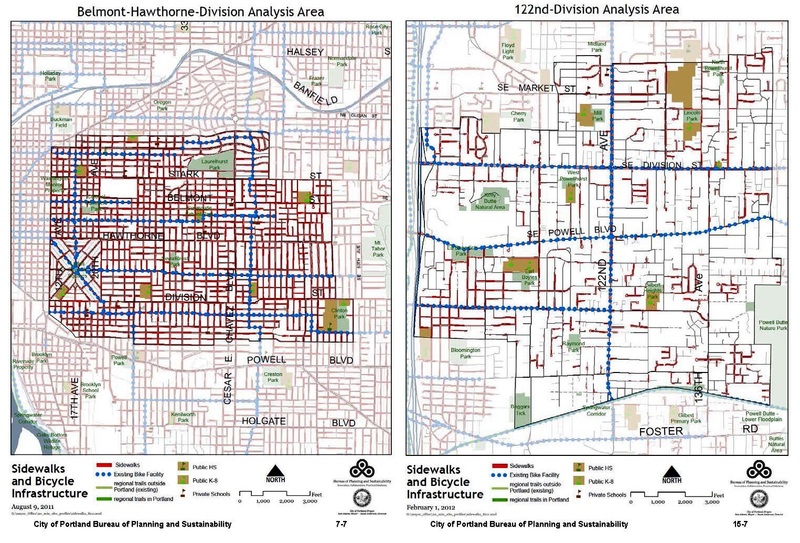 How to "retrofit" areas like 122nd-Division to reduce auto usage, and help meet the city's greenhouse gas emission reduction targets? How well can higher-density infill policies work in this more suburban context? I ran out of time to explore these questions in Portland -- but wanted to at least make note of them. Do you face these issues where you live? Let us know what strategies you've used. In a future post, I'll describe what my hometown -- Burlington, Vermont -- has done to encourage infill in our "New North End."